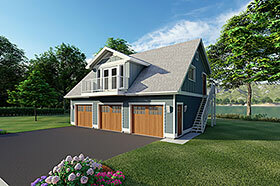 The two bedroom suite over this three car garage is excellent for year round living or for use as guest accommodations. The exterior staircase allows access to the suite without entry through garage for the option of renting. The deck off the front of the loft gives the living area a sunny open feeling. Question: How old is this plan? (90941) also, are there any limitations on state and county location? If everything is good and compatible with Union County NC requirements I’ll be purchasing these plans in a week or two. Thanks in advance! Answer: The plan was first built in 2006. As with all stock plans, these plans are designed to meet the general requirements of all building codes, however each state, province or municipality may have it’s own unique requirements, so there may be a need to have a local designer review the plans. We do not check our plans to see which states they do or do not comply with, however they are check against the IRC, which is the building code standard in most of the United States. Question: By law the bedroom has to have a closet. Where are they? Answer: Bedroom closets are not required in all building codes in North America, these plans were designed without closets in the bedrooms. Closets would need to be added to the design either by the home owner or we could add them but there would be a modification fee. Question: i have three questions - 1. Will these plans meet 2010 California residential/mehanical/plumbing//green/electrical/fire codes? 2. Do they have an engineers stamp? 3. Are the plans engineered for at least a 25 lb snow load? Answer: The plans are designed to meet most of the requirements of the IRC (US) and the NBCC (Canada), however each state, province, and territory has its own specific requirements and it is not possible to design the plans to meet all requirements. Therefore, as with all stock plans, you may be required to have a local design professional review the plans and add any extra notes or details prior to submitting for permit. The plans are not stamped by an engineer. 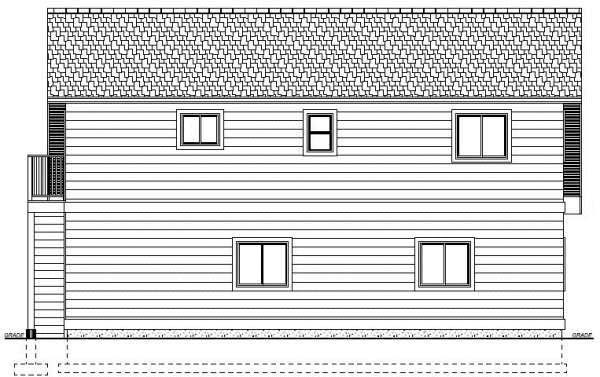 The plans have been designed for a 50lb roof snow load. Question: Does this come with all the plans needed for building permits? Answer: The plans are full structural plans ready to be submitted for permits, however, depending where you live you may or may not require a local professional review, this is not included.